There isn’t a music lover whose eyes don't well up on hearing the song “ Chitti Ayi Hai” by the legend, Pankaj Udhas. This anthem of longing still tugs at our heartstrings and evokes a deep sense of nostalgia.That is greatness of the soulful voice of the Padmashri awardee, Pankaj Udhas. With a singing career spanning over 35 years, Pankaj Udhas continues to be a music icon to millions of fans around the globe. This art form has blossomed in his velvet voice. Pankaj Udhas concert tour this summer in August 2019 covers centres across the UK and Europe. He will regale the audiences with his popular ghazals including the soulful Aur aahista keeje baatein, Jiye to jiye kaise and Ye gam e zindagi kuch to de mashwara; racy numbers Chandi jaisi rang tera, Na kajre ki dhar, Aaj phir tum pe pyar aaya and some ‘intoxicating’ ghazals such as La pila de saakhiya ,Maloom mai sharabi nahi and Hui mahangi sharab ki todi todi piya karo . Be there to witness the legend as he comes to your city to conquer your hearts accompanied by accomplished musicians on accoustic instruments like Bansuri (Indian Flute), Tabla , Indian Percussions, Mandolin , Guitar & Keys. 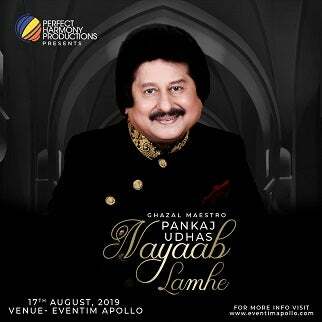 Pankaj Udhas UK tour is promoted by Perfect Harmony Productions Ltd, UK.